Trading U.S. Dollar Index options lets you capitalize on the dollar’s changing value. 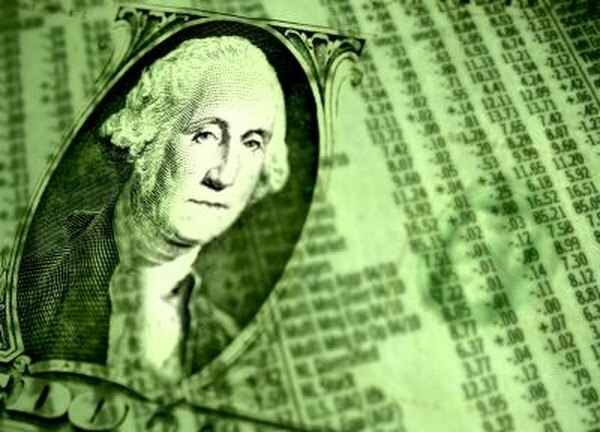 Options investors can use several different strategies to trade the U.S. Dollar Index. Traders can buy call options or open a bull option spread if they think the Index will rise. If it appears that it will fall, traders can buy put options or open a bear option spread. Sometimes the U.S. Dollar Index trades in a narrow range. When that happens, traders can use a straddle option strategy to take advantage of an upward or downward price breakout. Buying a call or a put option is one strategy to use if you’re sure which way the U.S. dollar is heading. You buy a call if you think the U.S. dollar will increase in value, or you buy a put if you think it will decrease in value. Your risk is limited to whatever you paid for the option. One option contract is worth $1,000 multiplied by the option cost. For example, if the U.S. Dollar Index is at 82 and the 84 strike call option is priced at $0.60, multiply $1,000 by $0.60 to get your option cost of $600. Use a bull call spread if you think the U.S. dollar will rise. To enter a bull call spread, the trader buys an in-the-money call option and sells an out-of-the-money call option. When you sell the call option, the option premium offsets the cost of the call option you buy. For example, if the U.S. Dollar Index is at 82.30, one strategy is to buy a 82.00 call for $970 -- a $0.97 option cost multiplied by $1,000 -- and sell a 83.00 call option for $600 -- $0.63 option cost multiplied by $1,000. The cost to put on the trade is $970 minus $600, or $370. A bear vertical option spread is the flip side of the bull vertical option spread. You use it when you think the U.S. dollar will fall. To open this spread, you buy one in-the-money put and sell one out-of-the-money put. The put you buy must have a higher strike price than the put you sell. The premium you collect from buying the in-the-money put option is subtracted from the cost of selling the out-of-the-money put option. Your risk is limited to the net cost of the options. The straddle option strategy is useful if you’re not sure which way the U.S. Dollar Index is heading. To open the trade, you buy an equal number of at-the-money call and put options with the same expiration date. For example, if the U.S. Dollar Index is at 82, one strategy is to buy one at-the-money call option for $1,430 -- $1.43 multiplied by $1,000 -- and buy one at-the-money put for $420 -- $1,000 multiplied by $0.42. Your total cost is $1,850. You profit when the U.S. Index moves higher or lower than one of the option strike prices.